Nolan is ready to run the iditarod :-) Well maybe next year with a little more conditioning. But he’s got the harness and booties. Thanks to the Seavey team for giving Nolan his first pair of booties. He does get big snow balls when we ski-jour, I have been clipping his fur. I learned that you can also singe the hairs on dog paws to prevent snow balls. 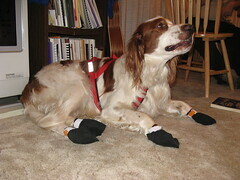 But you have to be careful not to light the dog on fire, I prefer the idea of booties. We prefer the bootie idea also. Had a friend once who wanted to singe off some loose threads of a macramed plant hanger. Her ceiling only got charred.